Refillable by design. Translucent sunscreen. Designed to snap into the Twist-Brush dispenser (08629), this all-natural, mineral powder sunscreen makes reapplying your face-saving sunscreen as easy as twist and swipe. UVA/UVB SPF 30 protection imparts a sheer, translucent coverage that glides seamlessly over bare skin (or even a full face of makeup) without leaving even a hint of tint. 1. Load pot into twist brush by holding brush upright and screwing pot upward until it stops. Remove twist brush cap and turn to expose brush. 2. Hold twist brush at a downward angle and gently shake or tap against the palm of your hand to dispense product. 3. Buff onto skin to build coverage. 4. Place the cap back on the twist brush. 5. Sweat. Reapply after 40 minutes of vigorous activity. Zinc Oxide 20%: Natural mineral that provides sun protection factor of 30. Milk Thistle Seed Extract: An anti-inflammatory and antioxidant that aids in post-sun DNA repair. Rhodiola Rosea Root Extract: An antioxidant and antiaging ingredient that helps skin resist stress and remain strong against pollution, UV rays, and extreme weather. -Vitamin E: Super antioxidant that increases effectiveness of sunscreen ingredients, retains moisture, and aids in skin strengthening. Mica, Boron Nitride, Squalane, Silica, Bismuth Oxychloride, Caprylyl Glycol, Tocopherol (Vitamin E), Phenoxyethanol, Lecithin, Isopentyldiol, Silybum Marianum (Milk Thistle) Seed Extract, Rhodolia Rosea Root Extract, Propanediol, Water. May contain: Titanium Dioxide (CI 77891), Iron Oxides (CI 77491, CI 77492, CI 77499). 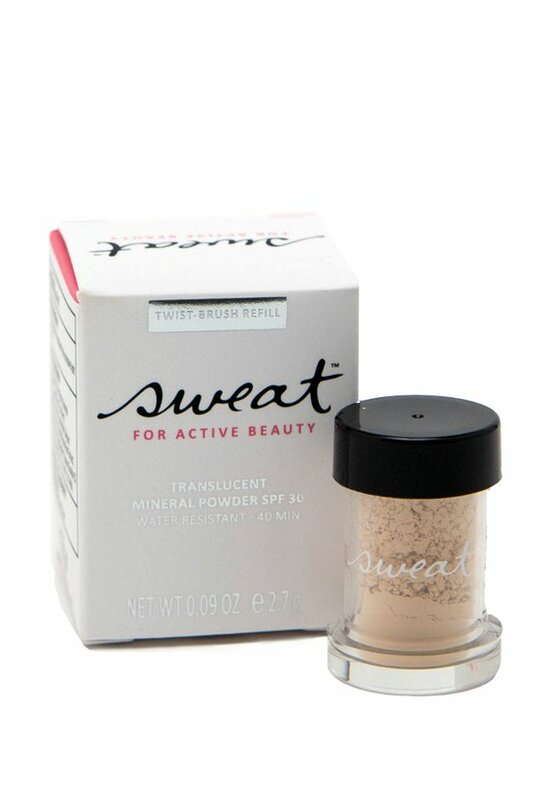 Thoughtfully engineered to offer simple ways to keep your skin healthy and beautiful, Sweat Cosmetics’ products are designed to protect, enhance and repair active skin. Their multi-tasking mineral powder foundation, sunscreen and bronzers are packed with botanicals, antioxidants and SPF that are all-natural, cruelty-free and wonderfully sweat-resistant.